We offer care and learning services for children from ages 6 weeks through 5 years of age. We are in our seventeenth year of operation. The first step in enrollment is to contact the director of the Center to check on space availability and to set up a time to visit the facility (contact information below). Full time care for Infants & Toddlers is $950 per month. Full time care for Preschoolers & Pre-Kindergartners is $840 per month. 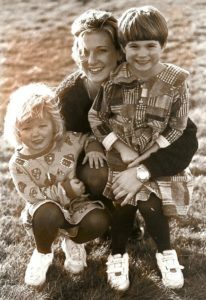 With two or more full time children, there is a 10% monthly tuition discount for the oldest child. There is a 10% monthly tuition discount for a child whose parents are active members of First Presbyterian Church Medford. We have a one-time registration fee of $50 per child. 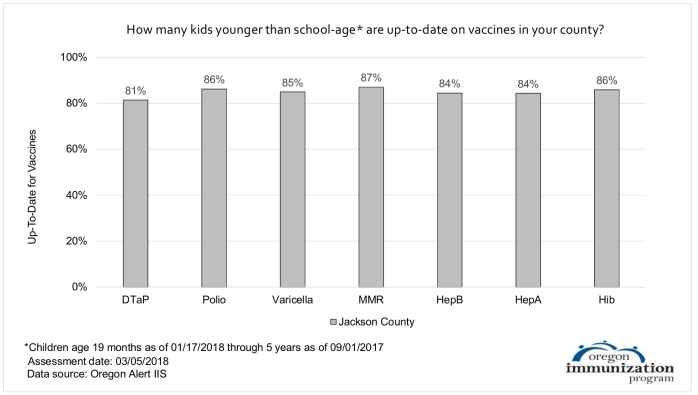 The chart shows Jackson County immunization rates for children from 19 months to 5 years old as of September 1, 2017. The Sarah Corson Center percentage of fully vaccinated children is 94% for 2018. The Sarah Corson Child Care & Learning Center has been in operation since 2001. The facility was purpose-built as a child care facility and is a state of the art, licensed child care institution providing quality childcare for for children as young as six weeks of age.